One thing I’ve learned in parenting is that yelling is not effective. Yelling at my children creates fear and sends them into fight-or-flight mode. However, staying calm and not yelling when you walk into your daughter’s room after she’s poured lotion all over the carpet can be very difficult! Or when she’s flushed a hand towel down the toilet and Roto-Rooter has to be called to unclog the toilet. Or when she throws the iPad across the room and breaks the screen. So what do I do instead of yelling? I turn around, walk back out of the room and take a deep breath… and make my husband deal with it! Just kidding… usually (it really depends on who is the calmest at the time!). We definitely have to be a team and take turns because parenting is hard. Staying calm is hard! So instead of yelling, what do I do? I take a deep breath (or ten), repeat a mantra to help myself get/stay calm and parent through connection. 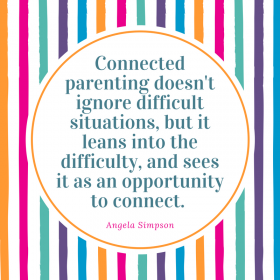 Connected parenting doesn’t ignore that the situation is difficult, but it leans into the difficulty and sees it as an opportunity to connect. Sometimes it may take additional trips out of the room, frequent deep breaths, and repeating the mantra over and over again. It helps to have a list of mantras to help keep me calm in the heat of the moment! If I’m not calm, I can’t help my child get calm. Just keep swimming (Finding Nemo). Don’t react, respond with love and connection. The calmer I am, the more effective I’ll be. My child doesn’t mean what she says out of anger. My child needs my attention; how can I fill this need? Build bridges, not walls (Martin Luther King Jr). My child is hurting, I need to help her heal. Get down at her level, meet her where she is. Engage, not enrage (Whole-Brain Child). My child isn’t giving me a hard time; she is having a hard time. Listen to what my child is trying to tell me through her behavior. Be patient and wait out the storm. Put your oxygen mask on first, then your child’s. Once I’m calm I have to help my child regulate her emotions because she doesn’t yet have the tools to calm herself down. It can be difficult to find the right thing to say to your child when she’s upset. It’s important to practice connected parenting to not make fears worse, all while offering reassurance and support. I have found that arming myself with key connecting phrases to use in the moment helps me be consistent and able to provide a connection in tough situations. Rather than telling my child that they’ll be fine or they don’t have anything to worry about, I try to use some of the phrases below to connect and help them through their struggle. Tell me about it. Encourage your child to use their words to share how they’re feeling. Listen, without interrupting, and be empathetic toward how they are feeling. It’s ok to feel ______. Validate your child’s feelings and help them to cope with those feelings in an appropriate way. I’m here for you. Share that it doesn’t matter what happens, that you will be there for your child supporting them and helping them through their tough feelings. What do you need from me? Does your child need one-on-one attention? Do they need space? Are they hungry? Do they need a hug, back rub or to be rocked? Help meet that need. You are safe. Often meltdowns occur because a child does not feel safe. When your child is anxious, her body feels like it is in danger and goes into fight, flight, or freeze mode. Reassure your child that she is safe and that you are there to keep her safe and protect her. You can do this! Encouragement can help conquer a fear. Like the Little Engine that Could, he repeated, “I think I can, I think I can,” and made it over the mountain. I know this is hard. Acknowledge that the situation is difficult. Your validation shows your children that you respect them. What can you do to get calm? Have a list of calming strategies to choose from. Some days hugs might help and other days screaming into a pillow, reading a book, listening to music or going for a walk may work better. You never told me about… (insert event that happened recently) OR I can’t wait until… (insert upcoming event) Get your child talking about something exciting that happened recently or an exciting event in the future. Sometimes a brief detour or distraction can help tough emotions subside. Circle back around to deal with the problem at hand once the child is calm. Let’s work as a team to get past this. Remind your child that they’re not alone and that you are a team and you will work together to get through whatever they’re going through. Can you draw a picture for me? Drawing about feelings can be easier for a child when it is difficult for them to describe how they’re feeling. Let’s go ____ (insert activity)! Go for a walk, swing, ride bikes, jump rope, do yoga, or go to the park. Doing exercise releases endorphins and helps relieve anxiety. We would like to protect our children from becoming upset, but it’s inevitable that at some point they will get hurt, they will have fears, they will feel sad or angry and when they do, it’s important for them to have tools to self-regulate and deal with the tough emotions. Every child is different and not all of these phrases will work with your kids. If one phrase doesn’t work, try something else. It’s important that even when it’s difficult, you stay engaged, and practice connected parenting. Eventually you’ll learn what works best for your child. Every child will need help calming down at some point, however if your child frequently struggles with anxiety or tough emotions, consider seeing a therapist who is trained to help.